Colombia and the US dismantle networks of "tragabilletes" at the service of Mexican drug traffickers. Colombia dismantled four organizations that recruited young people who ingested dollar bills covered in latex capsules, a method to launder Mexican drug traffickers money into the South American country's economy, a senior police official said on Thursday. 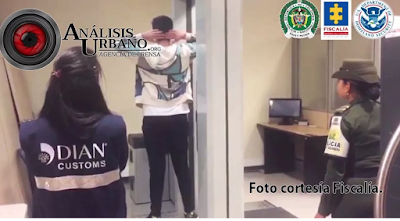 In the "Operation Eslabón'' the Colombian National Police, with the support of the Immigration and Customs Enforcement Service of the United States, ie ICE, captured in Colombia 27 people and dislodged the foreign exchange traffic organizations connected with Mexican cartels. 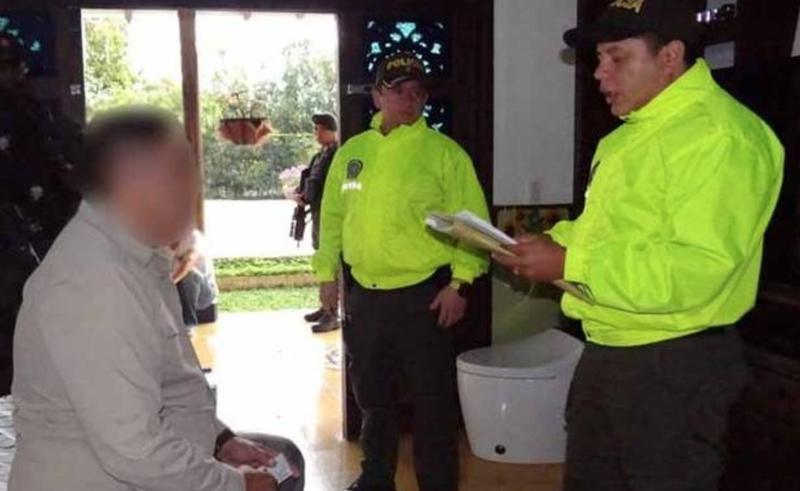 The director of the National Police, General Jorge Hernando Nieto, revealed that the networks recruited poor and unemployed youth in Columbia who traveled to Mexico where they ingested between 80 and 120 capsules of latex with money to return to Colombia. "With each ingestion a person could enter with up to $ 40,000, including there is one case of a single traveler that entered with $ 75,000", said the official at a press conference. "The money seized in this investigation amounts to $11 million dollars." One of the captured people had made 250 migratory movements between Colombia and Mexico since 2015. The capsules were made with latex gloves. Nieto did not mention the names of the Mexican cartels linked to the organizations that introduced the dollars to the country. Colombia is considered the world's leading producer of cocaine with more than 1,000 tons a year, most of which are sent to Mexican cartels that control drug trafficking, according to security sources. From the drug trade they receive in Colombia millions of dollars of income from narco traffickers, leftist guerrillas, criminal bands and dissidences left of the FARC, many who still move cocaine. Judicial diligences carried out simultaneously in Bogotá, Medellín, Bucaramanga, Manizales, Pereira and Neiva allowed the dismantling of four transnational currency trafficking organizations, which would be the links between the Mexican drug cartels and Colombian drug traffickers. Thanks to the joint efforts of the Attorney General's Office, the National Police, the Directorate of Taxes and National Customs (DIAN) and the Immigration and Customs Enforcement Service (ICE) of the United States, the so-called 'Operation Link 'in which 27 alleged members of these criminal networks were captured, who imposed various modalities of' human mail 'to camouflage money. During the detention procedures, the investigators seized 13 cell phones, two tablets, more than 2,700 dollars in cash, a storage device, six passports, air tickets, 10 agendas and four folders with information of interest for the process. The most used criminal resource for these structures consisted of hiding dollars in latex capsules for Colombian travelers to ingest them and, regardless of the risk they represented to their health, they agreed to take them from Mexico City to Bogotá. The investigations also revealed other illegal maneuvers such as foreign currency attached to the body or hidden in double-bottomed suitcases. The different controls carried out at the El Dorado international airport, where 49 of the so-called 'human mails' were captured, and other judicial police techniques allowed the identification and capture of the leaders of these money trafficking networks during the last year insisted on the cruel modality of the ingested. The arrest of Wílmar Hernández Sánchez, alias 'Pinocho' or 'Profe', who would be the main articulator of the structure and in charge of receiving travelers in Mexico, to host them and prepare them so they could ingest latex fingers, each with at least five $ 100 bills. This man records 250 migratory movements between Colombia and Mexico. According to the probative material and the testimonies collected, a foreigner intern could consume, on average, between 80 and 120 capsules, that is, he transported close to $ 40,000, although there were cases of citizens whose physical build allowed them to carry their bodies up to $ 75,000. The people chosen for currency trading were mainly young university students or unemployed, preferably between 25 and 35 years of age. The organizations had tokens whose specific role was to locate men or women who fulfilled these profiles and were determined to travel in exchange for a remuneration that could amount to 5 million pesos. On the other hand, Nasly Yolima Santiago Vegab or 'Isabela' was captured, who allegedly gave appearance of legality to the money that came from Mexico and put it to circulate in the financial system through exchange houses and local currency buying and selling . The elements obtained in the investigations would indicate that this woman, of 26 years, received the so-called 'human couriers' at the Bogota airport, took them to a hotel owned by "Gato", also captured, and there subjected them to different procedures. until they ejected all the capsules. One of the currency trading networks dismantled in the 'Operation Link' resorted to a different maneuver to enter foreign currency irregularly into Colombia. Apparently, informal or casual workers, people without stable work, were recruited to travel to other countries and return with different amounts of dollars, which did not exceed the established limits and were declared before the DIAN, but did not have a precise justification its origin. Within this group is a stylist known as 'Katherine', who made 180 migratory movements from Mexico, Ecuador, Chile, El Salvador, Peru and the United States, and would have moved slightly more than 10,172 million pesos since 2015. The 27 captured, including leaders, recruiters and logistics coordinators, were presented in concentrated hearings before securities control judges and prosecutors of the Specialized Directorate against Money Laundering, and charged them with the crimes of: conspiracy to commit a crime, money laundering and illicit enrichment. When I was in Delta we conducted an operation and uncovered this. Makes you wonder if any of these people died unaware of their allergy to latex. Any doctors reading this? What kind dangers to the body does this kind of method pose? Dr. Lowe's deci no proglema. Arriva con El dinero. Not upset that there's no video of the extraction procedure of these capsules with the story. Think of the nasty process to expel and clean, collect that money. All going to one place to undergo a process to ensure collection. What a new method to enrich the country, to continue making dope. The real way to move millions untraceable money 💰 is with cryptocurrency. Bitcoin at first now litecoin. Check where the atms of bitcoin are located. Crypto currency is another way to get your money taken too. No it's not. Bitcoin is traceable, it's a public ledger. You'd be better off using Monero. That one guy was so scared, he was shitting nickles. Brother can you spare a dime? Sure keep the change. Shoot, I work at a Payroll company, there are wayyyyy easier ways to clean money. You don’t even have to smuggle the money back to Mexico. Banks continue to grow financially because of this. Why are people so dumb? I'm sorry but this is the most idiotic way to transport money.